The audience -- a sold-out crowd of hundreds who had to apply to be admitted and pay a $3,500 fee -- consisted of representatives of the myriad businesses that seek to make a financial killing from climate alarmism. There were representatives of the solar, wind, and biofuel industries that profit from taxpayer mandates and subsidies, representatives from financial services companies that want to trade permits to emit CO2, and public relations and strategic consultants to all of the above. We libertarians would call such an event a rent-seekers ball -- the vast majority of the audience was there to plot how they could lock-in profits from government mandates on taxpayers and consumers. It was an amazing collection of pseudo-entrepreneurs who were absolutely impervious to the scientific and economic facts that ought to deflate the global warming bubble. 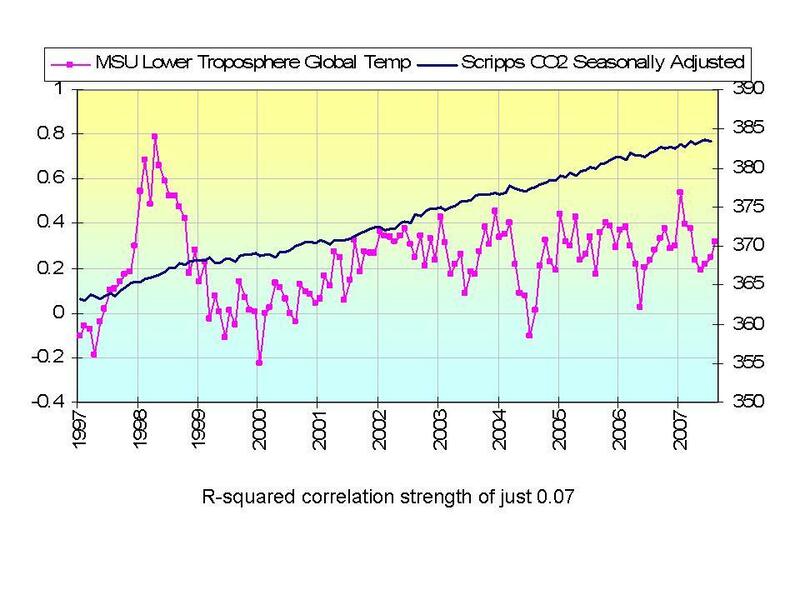 relationship between atmospheric CO2 levels and average global temperature since 1998. That slide should have caused jaws to drop and audience members to ponder why anyone is considering regulating CO2 emissions in hopes of taming global climate. Instead, it was as if the audience did a collective blink and missed the slide entirely. When I tried to draw attention to the slide during my presentation, it was as if I was speaking in a foreign dialect. The only conclusion I could come to was that the audience is so steeped in anticipation of climate profiteering that there is no fact that will cause them to reconsider whether or not manmade global warming is a reality. I don't think that government action on greenhouse gasses is justified. That's not to say that man is not helping nature warm the planet some, its that the man-made warming, when you strip away the exaggerations, does not justify the cost of preventing it. Since I wrote 80+ pages on it here, I won't delve much further into it. However, if we are going to take action, a carbon tax is way, way better than cap and trade. I used to think that cap and trade made more sense, but I have changed my mind. Cap and trade systems have a lot of potential for error and abuse, but there is one issue that is not adequately discussed: They are also a huge subsidy and protection for current businesses, effectively penalizing new entrants. These allowances have monetary value "“ a lot. Unfortunately, politicians will always favor an indirect tax over a direct tax because they are gutless and entirely free of any nagging principles. Cap and trade systems would raise consumer prices at least as much as a carbon tax, but the price increase would appear to be made by industry and not due to a visible government tax. Congress can point the finger at industry and say, it's not our fault, it's those greedy guys in industry driving up prices. Further, the carbon tax is hard to game. Everybody pays. But cap and trade - Oh the beautiful potential to milk various constituencies for donations! If the government sets up a program where some groups get credits for free, and some have to pay for them, well of course every industry is going to pour millions upon millions into politician's hands trying to make sure they are in the favored group. What a mess. We are already seeing the huge distortions coming from nutty ethanol subsidies, and that is due to the pressure of just one industry (farmers and ADM). Just think of the distortions form this program. There may be a good chance that misguided attempts to manage greenhouse gasses may well be the largest threat to the American economy and free marketplace, well, ever. Which, by the way, is why every Marxist and socialist on the face of the earth are right at the forefront of the global warming movement. If you suspect that the world may be warming, but not nearly enough to justify such costs in terms of both dollars and lost freedom, you might want to read this. If NYC is consistent in its logic, then it must ban these other substances. These substances showed the same level (or greater) of health risks at the same level of scientific proof by the same study authors. matter to the Board when it came to their trans fats research.